Step-down transformers reduce an alternating current (AC) voltage source down to a lower voltage level by inducing the electricity from a primary coil of wires into a smaller secondary coil of wires. Step-down transformers are found in electric power company systems and in a multitude of appliances for household and industrial uses. Size ranges are found from in a cell phone charger up to one the size of a house at the end of a high voltage transmission line. For standard household transformer testing a digital multimeter (DMM) makes a good test. Set the multimeter to read AC volts at a scale equivalent to the highest voltage needed. 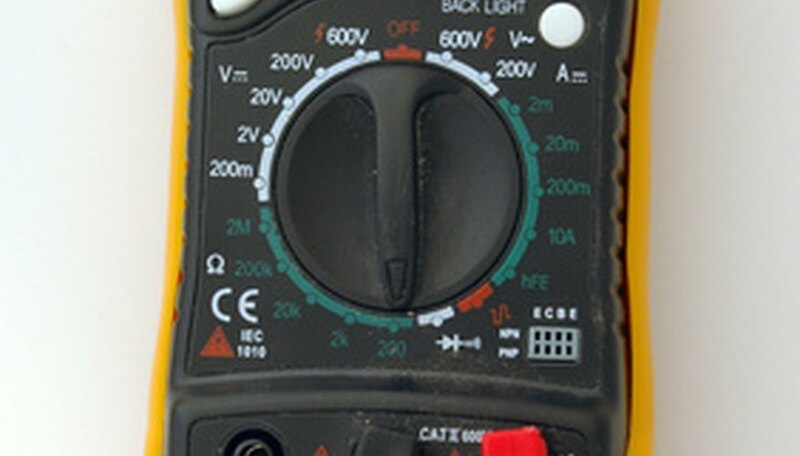 Most digital multimeters have a dial to turn for the different functions and scales. Touch your DMM leads to the input to the transformer. You need to know what the input voltage is, and read within 10 percent of that reading. If you don't have an input to the transformer, you cannot test it with the DMM. Touch the DMM leads to the output terminals of the transformer. The meter is not working. Many digital multimeters are alike in many respects. If you don't have a user's manual for the one you own please read a generic one (see Resources). Know and observe safety precautions when working around energized electrical equipment. Never work alone. Never attempt to work on a step-down transformer that is part of an electric power company's service. Call them if you have any questions or problems. Asmus, Richard. "How to Test a Step-Down Transformer Using a DMM." Sciencing, https://sciencing.com/test-stepdown-transformer-using-dmm-7224806.html. 24 April 2017.